I agreed to host a DisneySide party months back, in December, more than a month before Mother Nature decided to unleash her snowy fury on Boston to the tune of 108.6 inches of the white stuff. So, it was with massive trepidation that I attempted to pull off a party in the middle of the rather messy February school vacation week. In fact, I was so thrown off my game that I didn’t remember to take pictures of most of it because I was so busy running the party that I kinda sorta forgot to record it. Oops. Even so, we had a blast–and that’s the main point here. All of the kids in attendance are big Disney fans, whether they specialize in Princesses, Planes, or Cars. And, of course, you have the “less young” attendees who adore all of the above plus the wonderfulness that is Marvel and Star Wars. Going back to the beginning, the lovely folks at MomSelect and Disney offered bloggers the opportunity to host a party to show off their “DisneySide”, and this was my second year in a row taking them up on the offer. Last year’s party was a ton of fun, and the kids were clamoring to do it all over again! This year, I received a nice box stuffed to the gills with items for hosting the party, including: goody bag items for the guests (like photo paper packs from HP and luggage tags from Disney Parks), party supplies (plates, napkins, cups, etc. 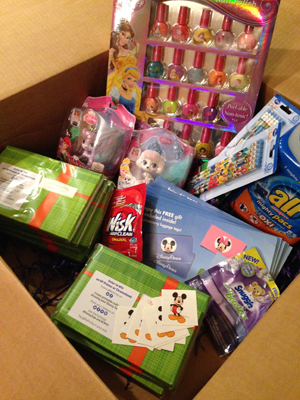 ), and giveaway items/hostess gifts (including a ginormous pack of laundry detergent pods). 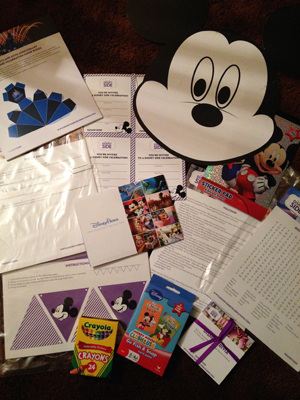 We hit Party City a few days before the main event and stocked up on some additional things to toss into the goody bags, so each one was stuffed with all kinds of Disney items for everyone in the family to enjoy! Since the party was in the early afternoon, we didn’t want to spoil appetites. We also had A TON of food left over last year due to my over-provisioning, so this year we pared it back a little. This year, we put out the “100 Acre Food”: a selection of fresh veggies and fruits for the kids to chew on. 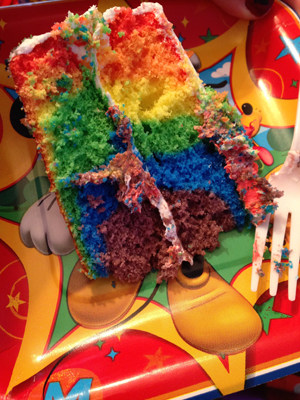 The hostess box also included a Tie-Dye Cake Mix from Duff Goldman’s line, and I set out to make that bad boy my own. I must say, the results were spectacular and rather tasty to boot! I set aside a bunch of the gifts for the kids and parents alike, and we had a series of Disney-themed games with each game’s winner receiving a prize. First up: Wonderball. The kids passed a Little Mermaid ball while sitting in a circle and singing the “Wonderball” song, and the last kiddo standing won a Palace Pet! Another game included in the hostess box was the “Pin the Smile on the Mickey”, and each kiddo took a turn sticking their mouth on the Mickey taped to the wall. The winning kiddo took home a fantastic Wilton cake pan shaped like Mickey Mouse’s head! Our train-shaped Wilton cake pan has gotten some good use in our house, and those are GREAT pans, so that Mickey pan is going to be good for years of adorable cakes. Little by little, we gave away all of the prizes (including the laundry detergent!) and distributed the goody bags, and then the horde of children made their way outside to sled on the mountains of snow we’d piled up over the last few weeks. Everyone had a blast inside, playing and getting sugared up, and then they burned it off on the sledding hills. Of course, the big payoff is in the fact that we’re already thinking about our NEXT trip to Disney World and, while we were in Austin for a wedding the other weekend, a friend decided to plan a last-minute trip to Disney World. Since our experience was still so fresh in my mind, I was able to share a ton of advice with her (including the blog post I wrote from what I learned on our trip). It was exhausting having so many kids in our house (I feel truly happy to have only TWO that I call my own), but the crowd had a blast, and their parents (some of whom stayed and some of whom came for the sledding) all reported happy, tired children. Mission accomplished! 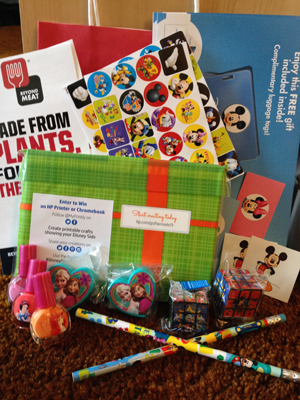 I received free products to use when hosting the Disney Side @Home Celebration. As with every other post on this site, all of the opinions expressed here are very much my own. The free products included the giveaway items mentioned above, party supplies, and party favors for my guests. This party was sponsored by MomSelect and Disney Parks and I greatly appreciate their including me! 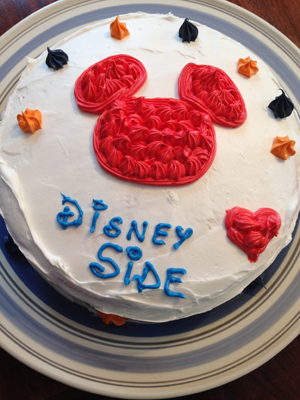 This entry was posted in Disney and tagged disney, disney parks, Disney World, DisneySide by crunchymetromom. Bookmark the permalink.